First of all, thank you to everyone who shared yesterday's post and kept Shawna's family in their thoughts! I'm so happy that they found her last night and she is safe and back home. And before I jump into today's post, I also want to give a quick heads up that I changed the blog layout. With a new year starting soon, I just wanted to do a quick makeover. Day 6: Smoky Black Eye Definer - I typically stay away from pencils, so I'm not sure it will get much use. Day 7: Strawberry Soap - I approve of the soap, the shape, and the scent. Total win. Day 8: Strawberry Lip Butter - I already own one of these. Good for keeping by the bed! Day 9: Strawberry Hand Cream - I prefer the scent to the almond one. Can't stop smelling my hands! Day 10: Relish the Moment Nail Polish - Basic red and it dried quickly. Not much sheen. Day 11: Glazed Apple Soap - Ditto to the previous soap! 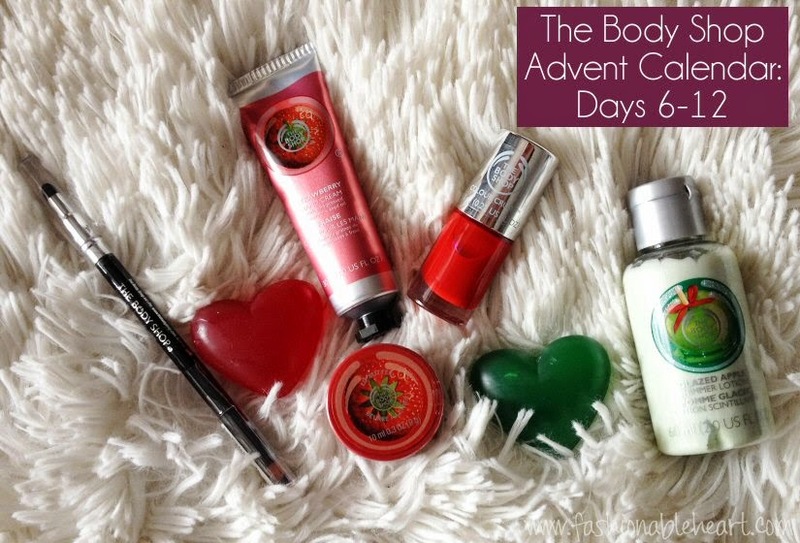 Day 12: Glazed Apple Shimmer Lotion - I want everything in this scent. Delicious! Days 1-5 are here. I cannot recommend the Frosted Cranberry and Glazed Apple holiday scents enough! I want everything they have in those scents. So so good!